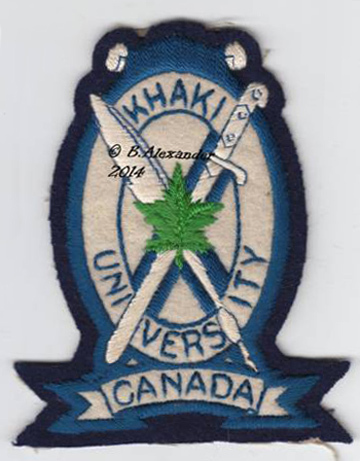 The Khaki University of Canada embroidered shoulder title. Author’s collection. Announced on June 16, 1945, the campus was quickly established at Leavesden, just outside of London. Formerly the site of 23 Canadian General Hospital, the location, comprising of approximately 40 acres was easily converted to a campus. The Khaki University was to provide instruction to members of the Canadian armed forces in first and second year university courses, which could be credited towards degrees when the participants returned to Canada and completed their programs of study at Canadian universities. To “give a Canadian flavour to the campus, each of the roadways was named after an early explorer. Similarly, the names of the Governors-General denoted the different parts of the University premises and the Houses of the Junior College.” With an initial enrollment of 565 students, supported by No 2 Administrative Company of 20 officers and 434 other ranks to run the facility, the Khaki University was officially opened by Field Marshall B. Montgomery on September 27, 1945. Khaki University embroidered blazer crest. Author’s collection. The unique shoulder title reading “KHAKI UNIVERSITY / OF / CANADA” in white embroidery on a blue field, backed again by another piece of white material making a white border, was issued for wear on the battledress. 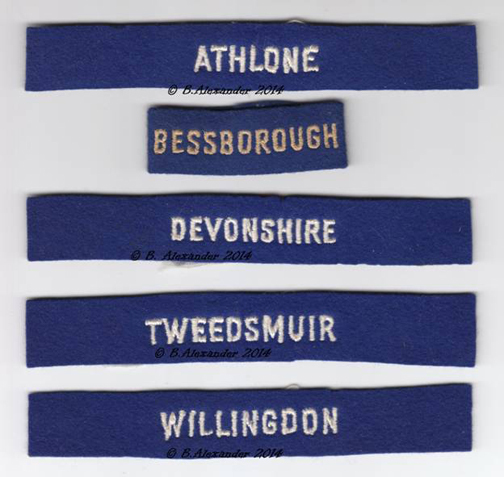 The shoulder slip-ons for the five Houses were in white embroidery on blue, reading “ATHLONE”, “BESSBOROUGH”, “DEVONSHIRE”, “TWEEDSMUIR” and “WILLINGDON”, each of the names a former Governor-General of Canada. The faculty slip-ons were a plain red strip of red cloth worn in the same manner as the House slip-ons. Additionally, during the fall term, a blazer crest was designed for wear on the blue jacket. These insignia identified the student body of the Khaki University. The five house slip-on titles for the Khaki University. The Bessborough slip-on has been stitched for wear on the shoulder strap. Author’s collection. The easing of the logistical bottlenecks allowed for a faster repatriation of the Canadian army than had been anticipated. 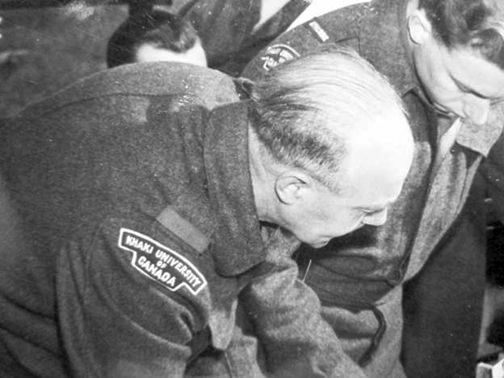 By the spring of 1946, the majority of the Canadian army had returned to Canada and the potential student body, and thus the need for the Khaki University had evaporated. The University only held two sessions, enrolling a total of 850 students in the Junior College before closing in April of 1946. The insignia remain as tribute to the unique educational experiment. An unidentified instructor and an Athlone House student, September 18, 1945. DHH. No part of this article may be reproduced in any manner without the express permission of the author. Beament G.E. Brig.-Gen. 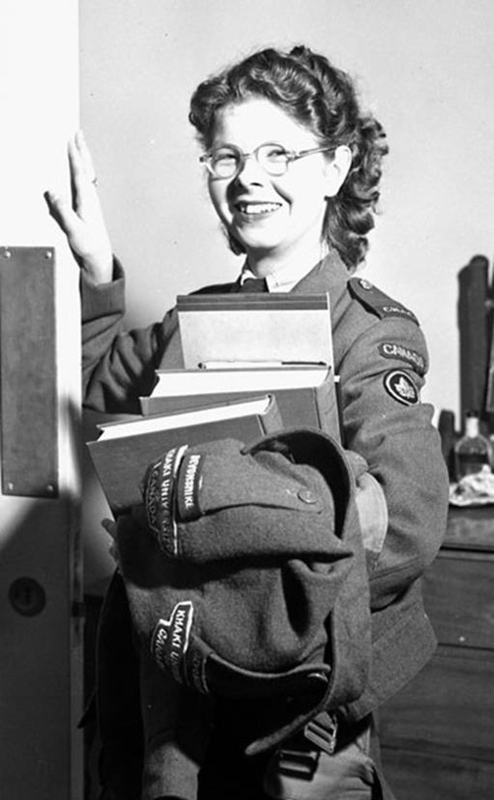 The Khaki University of Canada in the United Kingdom, 1945-46. An experiment in post hostilities education. Pg 254-261, in As You Were, Ex-Cadets Remember, Volume II, 1919-1984. R.Guy C. Smith, Ed.RMC Club of Canada 1984. Pg 256.